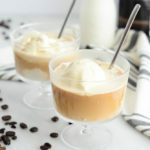 The classic Italian treat with a boozy kick - rich espresso is spiked with Cognac and bourbon and poured over creamy vanilla ice cream. Combine espresso, Cognac and bourbon in a small measuring cup. Scoop ice cream into a small bowl (or fairly shallow coffee mug) and pour espresso mixture over top. Enjoy immediately.